Classic northern Italian cuisine and an almost all-Italian wine list at this lively Brookhaven establishment. : A steady stream of regulars from nearby abodes routinely fills this establishment, even on weekdays, making reservations essential. Its relaxing décor is a froufrou-free zone, with warm lighting and charming accents here and there. Nicely fried seafood fritto misto has singularly sweet cod, prawns and calamari entangled with thin slices of fried lemon, parsley and capers. A plate of salumi and regional cheeses makes an appealing shared experience. We wish the pastas were available in half portions so they could really be "primi piatti," but they are plenty for two people, and never disappoint. 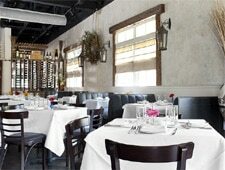 We like the tender house-made gnocchi; pappardelle with ricotta; and agnolotti, stuffed with braised short rib meat. Braised rabbit with cremini mushrooms and oven-dried tomatoes is another dish we've enjoyed. Bistecca, a flat-iron steak, comes grilled as ordered; its accompaniments will vary from season to season. Desserts embrace a raft of Italian classics, such as a warm chocolate tart with vanilla cream. On Sundays, the restaurant’s fixed-price, family-style, three-course supper includes numerous kid-friendly options. Valenza’s almost all-Italian wine list offers a large number of choices by the glass, and notes half-priced bottles on Mondays. Owner Michel Arnette, whose growing company comprises Haven and Vero Pizzeria, presents lots of special events and winemaker dinners.